Heavy Duty Walker manufactured by Invacare features an extra wide, deep frame with a large number of height adjustments to meet the needs of individual mobility patients. This Invacare Heavy Duty Walker has a composite lower side brace for added stability and strength. Invacare Heavy Duty Walkers are light and easy to lift and maneuver. 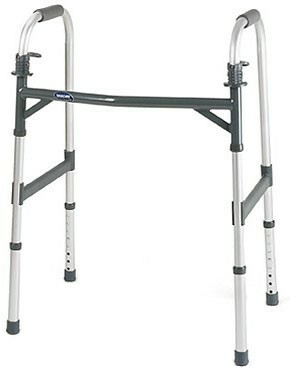 These Heavy Duty Walkers include PVC handgrips that provide comfort and long-lasting wear. The I Class Heavy Duty Walkers can serve as Bariatric Walkers and are equipped with anti-rattle silencers for quiet operation. Other Invacare Walkers with the I Class designation manufactured by Invacare include the Invacare Folding Walker, the Invacare Lightweight Walker, and the Invacare Wheeled Walker. Dual Release Paddles make folding easy and simple. Folding mechanisms are easy to reach from a seated position. Ergonomic release paddles make it easy to open and close this Heavy Duty Walker. Folding Walker for easy transport or storage. 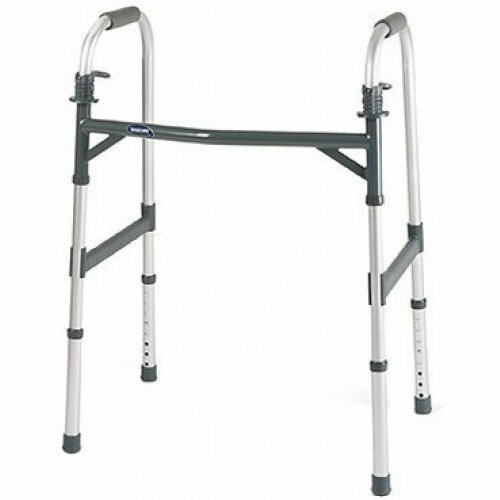 Lightweight Walker for easy maneuvering and easy lifting. Product Weight: 6 lbs. 11 oz. 4' 4" to 6' 4"
4' 4" to 6' 6 "
5' 3 " to 6' 4"
This specific product does not come with wheels or a tray. We have another item, the Class I dual release wheeled walker, that comes with front wheels.